Starring Daniel Radcliffe (even if you have been living on Mars you probably knew that) Ralph Fiennes, Emma Watson and about three million other actors hoping their roles lead to meaningful employment elsewhere. TMG realizes its hard to knock one of the most successful book and movie franchises of all time, but I’ll do it anyway. For one, the franchise passes itself off often as a kid thing. It may be for young teens but this is not a film for little toddlers. So what on earth were the idiot parents in the theatre doing with infants and toddlers? Satanic rituals, people eaten alive whole by snakes? Freaky creatures? I am sure some of these same nutball parents get their babysitting referrals off bulletin boards at the local Game Stop. And while we are getting real, isn’t all this freakish and dark fantasy stuff of sorcery and black magic the kind of stuff young teens spend way too much time with? It also seems like most of the people in this film are case studies for suicidal tendencies. No one is happy. Everyone is grim and staying alive for what? Certainly not the weekend at moms house, Christmas, Disneyland or even a good soccer game. Today’s youth spends way too much time in alternate realities. They need more human interaction like a good kicking around on a football field or basketball court. And why does everyone in this film fail to enunciate clearly and speak in other than monotones? My hearing is perfect and despite not being tuned into some of the weird character names, I swear some spoke entire sentences of unintelligible gibberish. They would never make good stage actors. The sound editing was just awful. The filming and visual effects were of epic scale and certainly stunning. For what these films gross, they should be. But what was the omnipresent tent that travels everywhere all about? Barely more than a pup tent on the outside, it transforms into a tent mansion when inside. Very cool. Can I buy one of those at Bass Pro Shops anytime soon? I basically wanted to stretch myself and see if a single Harry Potter film could stand on its own. It does not. For the first half of the movie I could not understand why everyone wanted to kill Harry Potter. By the end of the film, it all became very clear. I wanted to kill Harry Potter. Well not really, but I did want to suggest he take some motivational classes or study up on Norman Vincent Peale. The guy needs to lighten up and go to a concert. Do some work at a local shelter. Take up the guitar. Adopt a rescue dog. Maybe try out for the local band or go snow skiing. “Harry Potter and the Slopes of Vail” should be the next installment. Sure. That’s the ticket. Perhaps I am not qualified to pass judgment on this genre of sci fi, alternative reality, dark, fantasy films. I can say this. If you are over thirty and you were anxiously waiting to see this film, you need some serious counseling. You probably need to keep your registration current with the local district attorney as well. 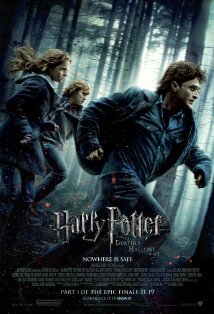 If you love Harry Potter and enjoy these books and movies, TMG is willing to be enlightened. But “enlightened” has the implication of positive in it. I found nothing positive in this film at all. Is there a moral or a lesson hiding in there somewhere Ms. Rowling? Please. Enlighten me.